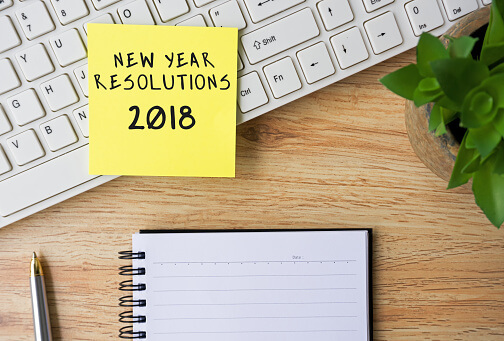 So, we know it may be a bit early to start thinking about New Year’s resolutions, but given that 58 per cent of Australians ¬– around 11 million of us don’t stick to our slurrily-made commitments of Dec 31, we thought that giving this year’s resolutions some advanced thought might not be a bad thing. According to a national survey conducted by finder.com.au, the most common New Year’s resolutions revolve around health and money. Most of us would like to have more of both. While having more money is an obvious wish-list feature, improving our individual health relates to our physical, mental and emotional wellbeing. • Lose weight – ok, an obvious choice for the health-conscious crowd. But those who succeed in this goal incorporate small, measurable objectives into this larger-than-life resolution. People who commit to ‘walking for 30 minutes, three times per week’ or similar, are much more likely to succeed than those who don’t plan on how to achieve this ideal. • Stay in touch – keeping connected with positive people in your life is good for your emotional, mental and physical wellbeing. And we don’t just mean via the internet. Expand your social network by taking a class, trying a new activity or simply picking up the phone to an old friend. • Quit smoking and reduce alcohol – both these resolutions will bring about obvious health benefits, as well as boosting your bank balance. While people often consider the health impacts of cutting the ciggies and busting the booze, the financial advantages can be an added bonus, fulfilling our most popular resolutions to be richer in both health and wealth. • Reduce stress – known as The Plague of modern society, stress has significant emotional, physical and mental impacts. Again, the secret to keeping this resolution is to detail ways you will help to manage stress in your life e.g. scheduling regular breaks from work, committing to regular fitness sessions, prioritising time with friends and family. • Get more sleep – it’s as close as we’ll get to the secret of eternal youth, because getting enough sleep can make you look and feel like a new, improved version of you. A lack of sleep has been linked to health-related issues including obesity and Type 2 diabetes and getting adequate sleep aids memory retention, concentration and can help better manage anxiety and depression. To achieve this goal, adopt a regular wakeup and bedtime routine and never feel guilty about an afternoon siesta! • One resolution is better than many. Giving yourself too many boundaries/rules/restrictions all at once is just setting yourself up for failure. You’re more likely to succeed if you choose one overall goal and break it down into measurable achievements. • Track your progress. Seeing how far you’ve come helps you to stay on track. Accept that you may have setbacks and fall off the wagon from time to time, but knowing where you started and where you want to end up keeps you focused. • Tell your friends. Sharing with friends – whether verbally, via social media or a note delivered to their door via carrier pigeon – makes you more likely to succeed. Once you tell people, you instantly feel more accountable. You can also use your social networks to gain support and keep you motivated. If you’re making resolutions toward a healthier you this New Year, XGolf Australia offers an ideal platform to learn new skills, make new friends and improve your physical and mental fitness in a fun, social and interactive environment. So true! Happy New Year from the XGolf Family.